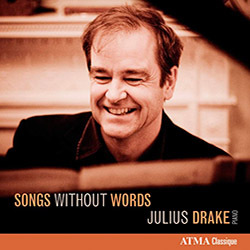 Julius Drake is renowned as one of the best accompanists working today and has chosen the ATMA label to record his first solo CD. He has conceived this recording as a personal journal and performs selections from Brahms’ Intermezzi, Mendelssohn’s Lieder ohne Worte and Schubert’s Moments musicaux, among others. It’s a treat to hear [Drake] take centre stage…the recital evokes lullabies and moonlight, nostalgia and intimacy, all of it cushioned by Drake’s warm sound, beautiful phrasing and affectionate touch…There’s a lovely unity to it and the pieces are well ordered to complement one another.